ALCOHOL RECOVERY INCLUDES MANY SIDE EFFECTS AND HEALTH-RELATED ISSUES, ONE OF THE MOST COMMON OF WHICH IS INSOMNIA. 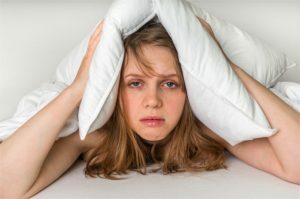 Insomnia – habitual sleeplessness – is a problem that emerges during the early stages of alcohol recovery and can last for weeks or even months. There is a strong relationship between insomnia and alcohol, even in those who have not become alcohol addicts. Some people think that they drink alcohol for insomnia, to help them fall asleep, but it has been scientifically proven that the opposite is true. Alcohol causes insomnia because it increases the time required to fall asleep, disrupts total sleep time, and increases the possibility of developing sleep apnea and snoring, both of which negatively impact sleep quality. Unfortunately, this insomnia-alcohol connection is even stronger during the recovery process, because the disruptive effects that alcohol has on sleep continuity and can even become even worse for some time after one has stopped drinking. In this article we provide information about alcohol and insomnia. If you or your loved ones would like additional information or to ask specific questions about how and why alcohol causes insomnia, please call our 24-hour hotline at (888)-459-5511 to speak with a knowledgeable representative. What Are The Symptoms Of Insomnia After Drinking Alcohol? How Is Insomnia Dangerous For Alcohol Recovery? How long does insomnia last after quitting alcohol? What Are The Symptoms Of Alcohol Withdrawal Insomnia? Alcoholic insomnia during withdrawal is caused by the body and mind adjusting to life without booze. In addition to experiencing nausea, tremors, and other physical symptoms, people trying to stop drinking often experience anxiety, excitement, and have worries about the future. Also, people in inpatient recovery programs can find it hard to relax and sleep in the unfamiliar environment of a rehabilitation center. How Is it Dangerous For Recovery? Needless to say, sleep deprivation increases the risk of car crashes and work-related accidents due to lack of focus and thinking problems. Such issues can lead to relapse. How Long Does Alcohol Withdrawal Insomnia Last? To answer this question accurately, we need to make a distinction between acute withdrawal (often referred to as detox) and post-acute withdrawal. Acute withdrawal or detox refers to the period of time it takes to physically eliminate alcohol from the system. Insomnia during this period typically starts within eight hours of the last drink, peaks within one to three days, and can continue in some cases for weeks. Post-acute withdrawal refers to a longer period, during which the body continues to experience uncomfortable symptoms as it adjusts to being without alcohol. Sleep problems during this period typically begin within three to five days after the last drink, and can last anywhere from several weeks to several months after the initial detox/acute withdrawal period is over. Interestingly, this type of insomnia from alcohol may present in the form of excessive sleep for the first few days, followed by longer periods without sleep. Insomnia is one of the first withdrawal symptoms in the early stages of recovery and can linger for months. It is a disruptive occurrence that impedes a good night’s sleep, which is necessary for everyday functioning, especially during stressful situations such as rehabilitation. In this article we have provided information about alcohol and insomnia. If you or your loved ones would like additional information or to ask specific questions about how and why alcohol causes insomnia, please call our 24-hour hotline at (888)-459-5511 to speak with a knowledgeable representative.